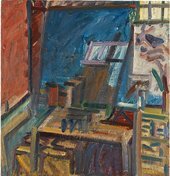 While posing, facing the back of the easel and looking off to one side, it is impossible to guess what is happening on the canvas. 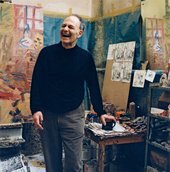 During my two hours in his studio Frank Auerbach is as active, in an extreme and strenuous way, as he was when I began sitting for him in May 1978, the month his retrospective opened at the Hayward Gallery. At the time I found him a highly intelligent, articulate artist, but already a reclusive one. He thrives, in his words, when he can make art in a self-forgetful state, wanting the resulting image to stand up for itself, not prone to looking back. Art is the performance of remarkable feats and requires exceptional efforts… Painting is a dumb activity, it has its own language, and it is, of course, essential to watch what the conjurer does and not listen to his patter. "I want the poem to be like ice on a stove – riding on its own melting.” Well, a great painting is like ice on a stove. It is a shape riding on its own melting into matter and space; it never stops moving backwards and forwards. 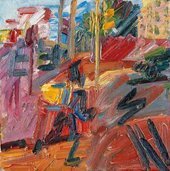 Private collection © Frank Auerbach, courtesy Marlborough Fine Art Photo: Prudence Cuming Associates Ltd.
What continually amazes me is how mobile his paintings remain, in the sense that they change with the angle and the light. 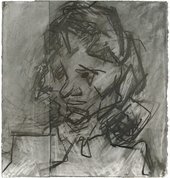 You are drawn deeper and deeper into the soul of the subject, the inflections and the drawing so expressive. The urban landscapes mirror the times – labourers with wheelbarrows in the 1950s, and in the past decade a jogger with a backpack. 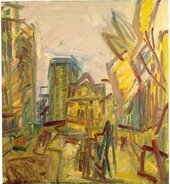 If Auerbach hadn’t stayed in the same studio in Mornington Crescent, Camden Town, since 1954 and wasn’t working every day, for many years from the same five people and nearby locations, and if he hadn’t uniformly resisted professional appointments or invitations to speak, he might have become a pundit, or indeed an artist with an international life. But equally he might never have arrived at the large 2014 interior with a phantom self-portrait in the corner. I would have lots of paint around me, with the painting resting on a very, very paint-y chair. 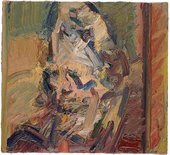 I never found these conditions irksome, to be on my knees and not able to get too far away from the painting, because, finally, all that thing of unity is in one’s head as much as it is found by looking. Like time travel, these things unlock memories for me, sometimes more, sometimes less. It certainly takes me back to a time which, after all, is 50 years ago. 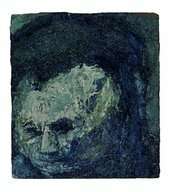 It does that thing that painting is supposed to do, that is to drag the past into the present and reanimate it. 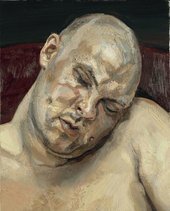 What a remarkable and resilient thing painting in oils can be, in the most daring and persistent of hands.